Jax and I were at the mall the other day and he wanted to look around in his new favorite toy store. 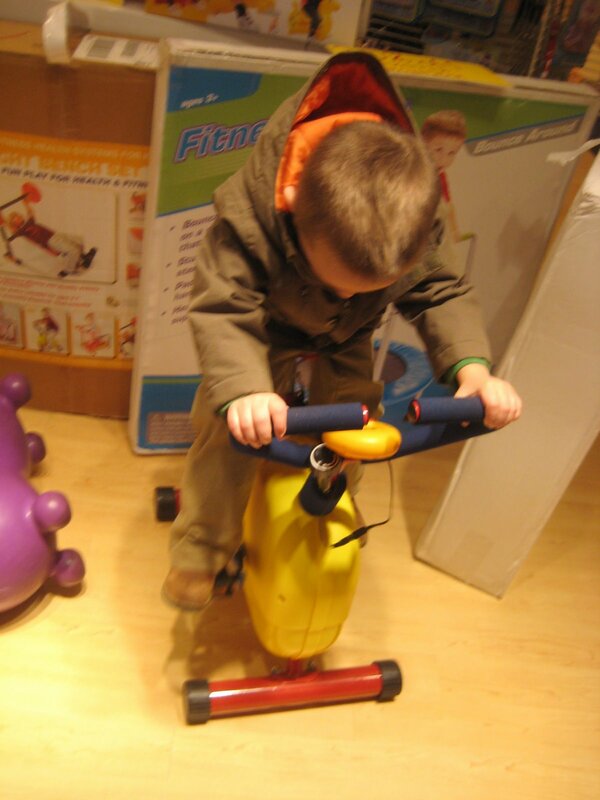 That’s when we spotted this fitness bike for kids! REALLY?? I mean, I’m all for teaching kids about health and fitness, but is a stationary bike for ages 3 and up really necessary!! Jaxon did think it was pretty cool! Riley wants the bike, weight bench and treadmill! I have seen the bike that hooks to the TV and they are playing a game while ridding….which TOTALLY makes sense to me! I mean our kids need to be entertined at all times, every second of every day! Right??? ; ) (I hope you can hear the sarcasm! )PS Love the new blog site! i saw this after christmas… pretty crazy! I think that is taking things a little to far! Jaxon did look like he was having fun, though. Amiya just asked me today if I would take her to 24 Hour Fitness so she could work out. I laughed and told her she was too young. Her response was, “Well, is there a gym I can go too?” What is wrong with this kid? Maybe I should look into getting her one of these bikes! Now that is just to much! The sad part is I’m sure they sell tons of those little bikes! LOL To funny. Jax does look like he is enjoying himself there. #winnwebuilt update! The house is really starting to take shape! This past week they finished painting the whole house!! We have cabinets and gorgeous countertops! The stairs and railings have been stained. Up next: concrete, exterior stucco and paint. I guess it’s time to start packing! And... that view is still gorgeous every day! Last weekend Eli, along with his team played their hearts out and it really paid off!! E even played keeper a bit! I love his passion for his sport! We celebrated our Jax turning 14 today! I cannot believe we have a kid this old. Jaxon is one of a kind. He really does try hard to be a nice human. I am so proud to be his mom. ❤️.